Release of the Compact Economy Flexible Modular YG12F A high-speed, multipurpose surface mounter with excellent cost performance - News Releases | Yamaha Motor Co., Ltd.
Yamaha Motor Co., Ltd. announces the development of a surface mounter named the "Compact Economy Flexible Modular YG12F" that achieves both high levels of component mounting capability and excellent applicability to a wide range of component types, while maintaining a low price tag. Sales of this new model will begin on Nov. 2, 2009. Based on Yamaha's YS12F model designed as a compact, high-speed, space-efficient low priced surface mounter, the new YG12F has been developed as a model to function with a conventional pneumatic tape feeder (*1). It achieves a high level of component applicability with the capacity to mount large electronic components of 0402 - □45mm, compatibility with the 15-pallet automatic tray stacker, "ATS15," a recognition function for ball type electrode components (*2) and the capacity to mount components with a height of 15mm or less. It also achieves a high-level balance of high-speed mounting with a throughput of 20,000CPH (*3), space economy and low price to provide excellent cost performance. Tape Feeder: Device that supplies chips (electronic components) to the surface mounter that are packaged on a tape. Ball type electrode components: Ball-shaped electrodes (bumps) of solder created on the bottoms of components to provide a direct electrical connection to the printed circuit board and thus reduce the amount of surface area necessary for components on the printed circuit board. Called BGA, CSP, etc., they are commonly used as a package with large scale LSI and high-performance, high-cost components. CPH (Chips Per Hour): The total number of components that can be mounted in an hour. Expresses the processing capability under various conditions. In the electric/electronic components mounting industry there is increasing demand in recent years for a high-level balance of productivity, applicability to advanced components, facility space efficiency and cost performance. The new model YG12F answers these needs at a low unit price. It has been developed as a popularly priced model with excellent multipurpose functionality including compatibility with conventional pneumatic tape feeders and a ball type electrode component recognition function. Combines good component mounting capability with a throughput of 20,000 CPH (Yamaha optimized conditions) and outstanding component applicability with the capacity to mount electric/electronic components of 0402 - □45mm size and with a height of 15mm. Recognition and mounting of ball type electrode components including BGA/CSP and special connectors by means of side light (option) and rear-side multi-camera (option). 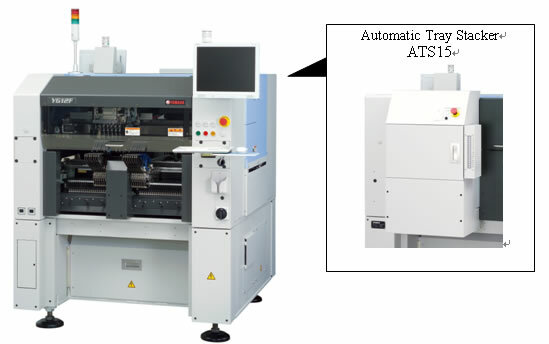 Choice of optional manual tray or automatic tray stacker, "ATS15." Improved space economy and operational efficiency with the capacity to process large printed circuit boards of up to L510mm×W460mm despite the compact platform size (L1,254×W1,440mm). Multiple Accuracy Compensation System (MACS) adopted: A system to compensate for factors causing changes in accuracy in both mixed and multilevel ways in order to guarantee a consistent mounting accuracy range of ±0.05mm. Maintains the basic functions and performance of the base model YS12F, including outstanding space efficiency, high-speed mounting and optical image recognition device, etc. Furthermore, many auxiliary equipment options are available.